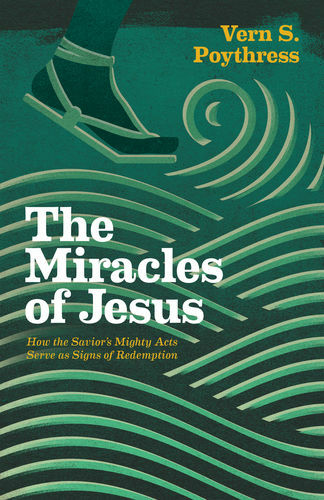 Poythress, Vern S. The Miracles of Jesus: How the Savior’s Mighty Acts Serve as Signs of Redemption. Wheaton, IL: Crossway, 2016, pp. 271, $19.99, paperback. The Miracles of Jesus is structured in four parts: Part 1 introduces the topic of Jesus’ miracles; Part 2 analyzes and illustrates some of Jesus’ miracles in the Gospel of John; Part 3 provides a comprehensive examination of Jesus’ miracles in the Gospel of Matthew; and Part 4 concludes with an examination of the miracle of Jesus’ resurrection and its application to individuals. Parts 2 and 3 comprise the main section of the book, as the division of chapters attests (3-8 and 9-36, respectively). The focus on the Gospels of John and Matthew is intended to complement the work of Richard Phillips (Mighty to Save: Discovering God’s Grace in the Miracles of Jesus), who in a 2001 volume published by P&R similarly analyzed Jesus’ miracles in the Gospel of Luke (p. 30). Even though the analysis of Jesus’ miracles in Matthew comprises the longest section of the book, arguably the central section is located in Part 2, where the thesis and hermeneutical method are developed. 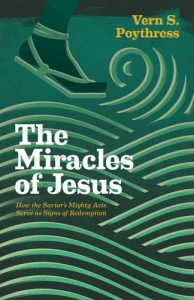 The thesis of The Miracles of Jesus, which is clear enough from the subtitle, is that Jesus’ miracles are signs of redemption. As “redemptive analogies” (p. 30), they point beyond themselves to a greater act of redemption, namely, the death and resurrection of Jesus. Jesus’ miracles are not random acts of kindness and compassion but are “organically related” (p. 64) to Jesus’ accomplishment of redemption and his application of redemption’s benefits to us. Hence, the reason why Jesus’ miracles are linked to the kingdom of God is because the gospel of the kingdom concerns a doing away with sin: “Salvation, comprehensively viewed, includes more than healing diseases. At its heart, it is healing from sin. And so the miracles are signs of the kingdom” (p. 162). Specifically, Jesus’ resurrection effected the dawn of the promised new creation; his miracles, therefore, testify to this greater reality of a new heaven and new earth in which righteousness dwells (pp. 232-35). The method used to support this thesis follows Edmund Clowney’s approach to typology (see Chapter 6). Especially where there is no explicit biblical teaching on the meaning of Jesus’ miracles—as often is the case in the Synoptic Gospels—Poythress argues we should utilize a typological approach, which seeks to discern the original referent of any given symbol in Scripture, and then to discern how that referent is fulfilled in Jesus’ death and resurrection. For example, the Old Testament sacrificial system symbolized or referred to Israel’s need for forgiveness of sins through a substitute, a referent that found its final fulfillment in the substitutionary, sacrificial death of Jesus on the cross (pp. 66-67). Similarly, Jesus’ own miracles are typological, for they each symbolize a specific truth of what Jesus has come to accomplish, which is ultimately grounded in his death and resurrection. For instance, Jesus’ feeding of the 5,000 symbolizes his ability to provide spiritual food, which was accomplished definitively and finally on the cross. Hence, the feeding of the 5,000 is typological of Jesus’ sacrifice on the cross by which he provides himself as our spiritual food (pp. 68-70). Indeed, all the miracles in the Bible—not only those found in the Gospels—point beyond themselves to Jesus’ greater work of redemption through the cross and resurrection (pp. 247-51). Poythress has provided the church with a much-needed guide to interpret the meaning and significance of Jesus’ miracles, for they can be too easily divorced from his death and resurrection. The approaches to miracles by liberation theologians, “social gospel” adherents, and those associated with the “prosperity gospel” typically fail—in their own way—to see this organic connection, which leads to a misunderstanding and misapplication of the mission Jesus came to accomplish and the nature of the already-but-not-yet-consummated kingdom of God. Poythress rightly shows that the miracles must be interpreted in light of Jesus’ climactic death and resurrection. At the same time, I wonder if Poythress subtly undermines some of what Jesus accomplished through his death and resurrection when he suggests that Jesus’ physical healing was never the greater good but only pointed to a greater spiritual reality. Concerning Matthew 8:16-17, which affirms that Jesus’ healing and exorcisms fulfilled Isaiah 53:4, Poythress says, “The full passage in Isaiah 53 uses the language of disease metaphorically to indicate how the coming servant will suffer as a substitute for sin . . . Deliverance on the physical level symbolizes deliverance on the spiritual level” (p. 114). I don’t disagree that Isaiah 53 emphasizes how the servant will be a substitute for his people so as to deal with their sin. However, Isaiah 53 says more than this, for it speaks holistically of what the servant will accomplish: his death for sin will bring us “peace” and “healing” (Isa 53:5). These terms describe both physical and spiritual realities, for they depict a world where all things have been made new. Jesus’ healings and exorcisms in Matthew 8:16-17, therefore, do not merely point beyond themselves to the fact that Jesus has come to deal with our sin—though this is certainly included—but they suggest that Jesus is the servant of Isaiah 53 who has come to make all things new by means of his death and resurrection. Since his mission was to deal fundamentally with the root problem, namely, our sin, it is not surprising that at times the Scriptures indicate Jesus’ mission also included the eradication of the results of sin, such as sickness, demon oppression, and death. To be clear, I am not saying that Poythress disagrees in toto with my concerns—rather, he notes his agreement with these points in various places (e.g., pp. 40-41, 115, 172). Nor do I disagree with Poythress’ main point: that Jesus’ miracles function typologically as signs of redemption. Rather, my concern is that we ascertain precisely the nature of that which the miracles typify. If we interpret Jesus’ healings and exorcisms merely as metaphors or symbols for spiritual realities, we run the risk of minimizing the Gospel writers’ holistic witness concerning the nature of the redemption Jesus accomplished through his death and resurrection. The Miracles of Jesus is a valuable and much-needed contribution for the study of Jesus’ miracles. It would prove useful for pastors, particularly when they are preparing to preach through one of the Gospels. Educated laity would also find this book useful for personal study, especially in Chapters 8 and 38 where Poythress provides specific examples for application in daily life. Finally, this book could be considered for use in an undergraduate class on the Gospels, for it introduces the hermeneutically-valuable notion of typology and seeks to apply it to Jesus’ miracles.